The trick is to use IFTTT website, create a new account, add the RSS applet. On the site you want to search, perform your search, copy the corresponding RSS feed URL from that search (usually there is a button for RSS feed URL after you search), paste the URL into the IFTTT applet which is set up to email you when new items come up! On ebay, enter your search criteria as you normally would, to get exactly the search results you are looking for. Copy the URL in the address bar, then add “&_rss=1” at the end. This is the RSS URL that you will be pasting into your app. Enter your search terms and click to get your search results. Under the search results at the bottom right corner, there is an orange RSS icon. Right click that icon and “Copy link address”. This is the RSS URL you will paste into the app. Exactly the same procedure as for Kijiji above. At the very top center of the page that comes up, there is an orange RSS icon, and an orange little icon to the right. 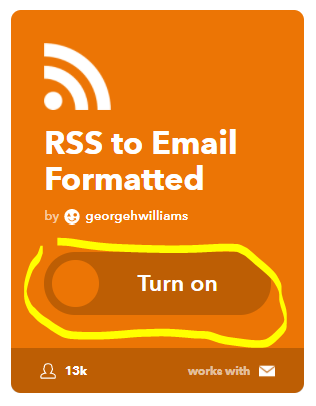 Right-click on the little orange icon next to the orange RSS, select “Copy link address”. You’ll paste that into your app. I wasn’t able to find any RSS feed search feature for this site, but they have a “Set up alerts” option if you sign up on the site. For your email address you could use the specially formulated email address that goes to your non-smart phone (see special email addresses below), or of course, just get email notifications on your smart phone. 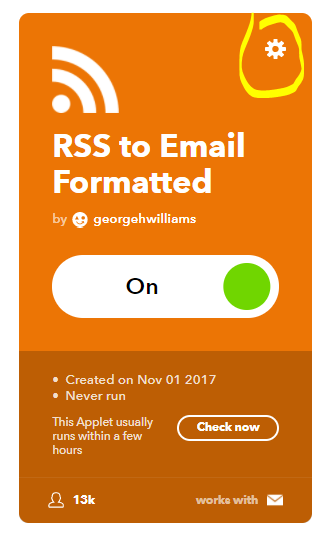 Go to this URL for the IFTTT “recipe” that uses the RSS and Email applets together in a recipe to send email when RSS feed item arrives. Click to turn it on as shown. To add more searches, click on the link My Applets and there should be another copy of the same applet that you can customize. Otherwise, use the same link you clicked originally to get the recipe again to add more RSS -> Email searches! Just add them and click the gear icon to customize each search. 3 Comments on "How to get an email when an item you want is posted on kijiji, ebay, craigslist … (Automatic RSS to Email service)"